Nutribullet vs Ninja – Which is the Best Compact Bullet Blender? Today we're comparing the most popular bullet blenders, Nutribullet vs Nutri Ninja to help you decide which one is right for you. 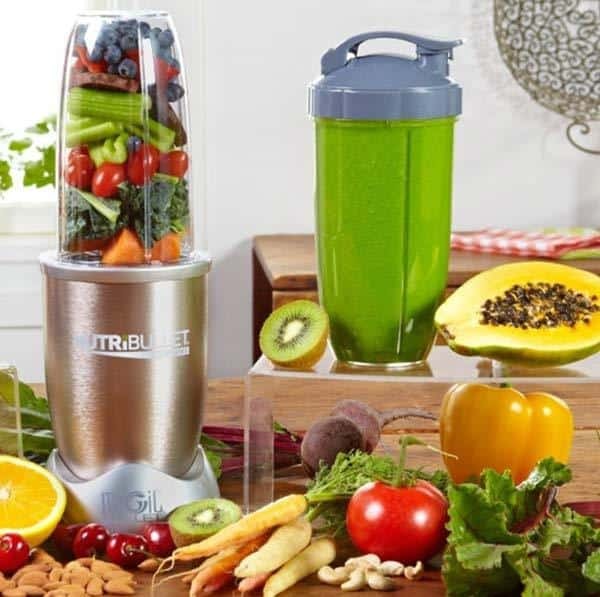 A bullet blender is a compact personal blender that you can use to turn vegetables and fruits into smoothies, preserving as many nutrients as possible. The Nutribullet is a good choice if you want simple on and off with no extra programming. You just want the extracted nutrients of fruits and vegetables but don’t plan on incorporating too much ice. On the other hand, the Nutri Ninja Pro bullet is a good choice if you want a more advanced and effective blending plus ice crushing capabilities. You want more than one speed to control the blending. If you like the Nutribullet name brand but still want better ice crushing, consider the higher end model Nutribullet RX. This model has a 1700 watt motor, hands-free operation and a heating cycle for soups and such. Why go for a bullet blender? Quick Comparisons - who wins what? Bottom Line - which is the best blender? When I was looking to lose some extra pounds and make sure I'll not put myself at risk of getting diabetes or heart disease, it was apparent I needed to modify my diet. I started making smoothies the old fashioned way, using a regular blender. Their textue wasn't that great. Blenders of this type are compact enough to be used in small kitchens or for small quantities such as single-serve, plus they work quickly and efficiently. In our review we are comparing two similar personal blenders with a bullet shape. Our aim is to determine which brand delivers on smoothest smoothies, have a powerful motor for extracting nutrients, easy to assemble and clean, and offers good value. 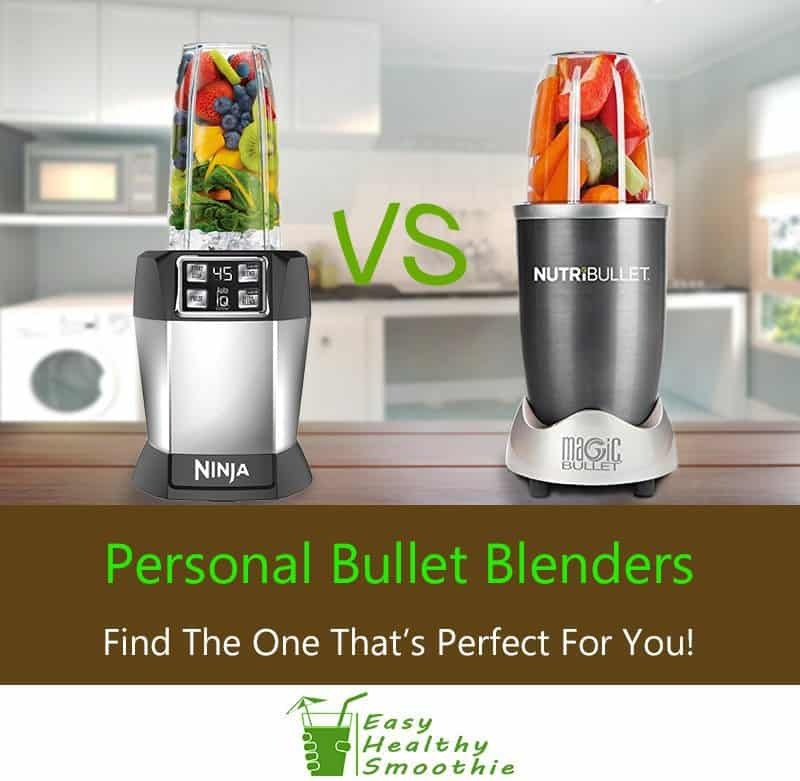 I chose to compare Ninja and Nutri Bullet because they are both well known name brands, have similar capabilities and features, and fall into a mid range price. Both blenders are nutrient extractors with special blade assemblies that offer the great nutrition for the user. They both solve the problem of complicated setups by having an easy to assemble construction. This kitchen appliance is presented as a "nutrient extractor blender". It means it has specialized extractor blades to breakdown the fruits and veggies at the cell level. This is claimed to deliver you the purest nutrients for better absorption and digestion. The unit has a 600 watt motor and just one speed. The package includes the power base, extractor blade, 20 oz. tall cup with lip ring, 18 oz. short cup with handle and lip ring, a user guide and recipe book and a pocket nutritionist booklet with nutrition facts for a healthier you. This is the classic model, which comes with a power base, 1 tall cup, 2 short cups, two types of blades (flat blade, emulsifying blade), 2 re-sealable lids, recipe book and pocket nutritionist book. The Pro model is a 9-piece version which includes a power base, blade, 32 oz. Colossal Cup, 24 oz. Tall Cup, handled lip ring, regular lip ring, flip top to-go lid, the life changing recipes book and the pocket nutritionist book. 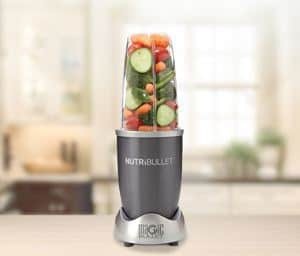 The Rx is high-end and has a more powerful motor (1700 watts), a heating unit for making soups and hands-free technology not seen in the other Nutribullets. We have an in-depth guide and review of this top of the line model here. Vitamix also offers a high-end blender/extractor/juicer. The Nutribullet is priced much lower than the Vitamix, but can still satisfy you, if you're looking for smoothies with a smooth texture, and aren't a big fan of ice in smoothies. For a comparison of the Vitamix against the Ninja, see our guide. For a low range nutrient extractor there is the Elite Cuisine which has the various cups and jars but less than half the power at 300 watts. It is also less than half the price. The Nutribullet is a good choice if you are looking for a simple, easy use blender. ​The Nutribullet is advertised as having the ability to break foods down to the cellular level giving you nutrients that are easily absorbed and digested. It does this through the "cross extraction" blades that are designed to be especially efficient in pulverizing whole foods. This specialty blade design results in a more smooth texture of your smoothies, which is very desirable. The 600 watt motor with the high torque power base isn’t the strongest we’ve seen, however combined with the specialty blades, it is more effective than stronger motors. 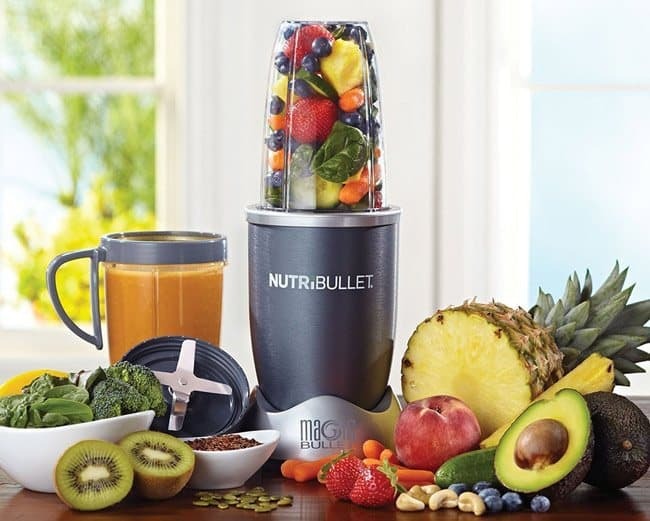 Note: Nutribullet has also released models with strong motors, such as the Nutribullet Rx, which boasts a 1700 watts motor - among the strongest in this price range. Assembling the Nutribullet is a snap. Just fill your cup to the appropriate level with the fruits and veggies you desire and screw on the cross extractor blade assembly. Place into the blender unit, twist and apply pressure. The motor will start and voila - you have a smoothie! One of the things we really liked about it, is that it offers an affordable price for a unit that has some nice features. 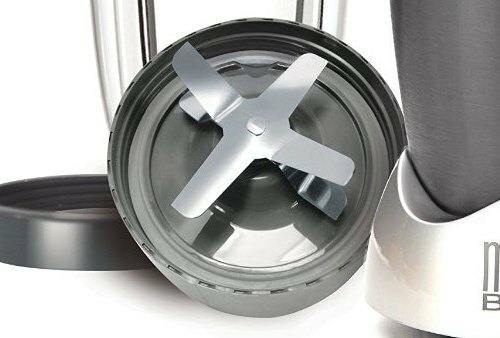 The cross extractor blades, a high torque power base, a 1-year standard warranty plus a 4-year extended warranty - bringing it a little closer to the Vitamix 8-year warranty - just to name a few. The Ninja Bull﻿﻿et is a nutrient extractor blender designed to liquefy solid foods, fruits, veggies, and nuts in order to make a smoothie beverage. The goal is to break down the food to the point where the body can digest and absorb it easily giving you the best nutrients. 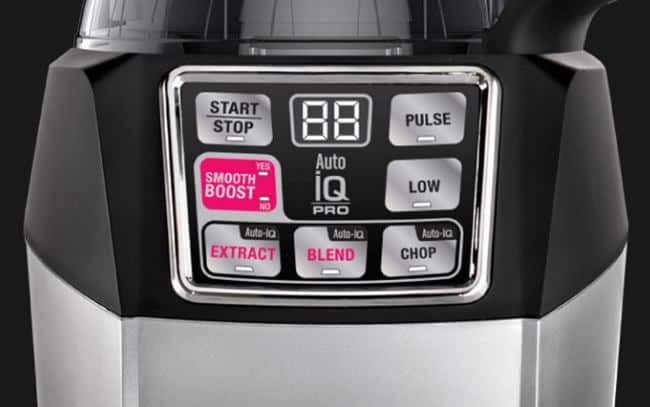 It uses a 1000 watt motor with three speeds on a digital keypad: pulse, blend and ultra blend. The Ninja package comes with the blender unit, a jumbo 32 oz. cup, a regular 24 oz. cup and a small 18 oz. cup, sip and seal lids, instruction book and 30-recipe inspiration guide. The model Nutri Ninja with Auto IQ (BL482) is on the lower end of the Ninja extraction blenders. You may be able to find the BL455 still sold by some retail sites, but Ninja is no longer producing these models. These two units have the bullet features as well as full-size blender features along with the programmable speeds. These units are somewhat comparable to the Vitamix S-Series but at half the price or more. A comparable low-end model is the Bella Rocket Extract Pro with a 700 watt motor. 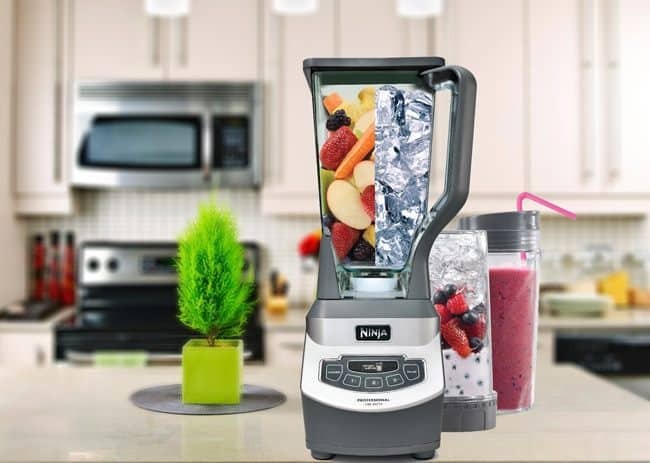 The Nutri Ninja with Auto IQ (﻿BL482﻿) is a good choice if you are looking for some upscale features such as programmable blending, 1000 watt motor and ice crushing technology. The Nutri Ninja with Auto IQ (BL482) is NOT a good choice if you are looking for something simple and uncomplicated. You would be better served by the Nutribullet that has a good motor and one speed. The Nutri Ninja uses registered Pro Extractor Blades to extract the nutrients. The blades break down foods to the base level so the body can absorb and digest easier and benefit more. The Nutri Ninja has programmable settings with a digital keypad. The settings include pulse, blend and and ultrablend giving you control over the blending and offering more flexibility in how smooth you want your smoothie. The Nutri Ninja is designed to be as easy to use as possible: fill the cup with your chosen ingredients, screw on the blade assembly, seat in the blender unit. Then press the program setting you want, and in seconds you have a smoothie. The Nutri Ninja is made by a company that has an overall good reputation. The 5-year VIP warranty brings it closer in line with some of the high-end brands such as Vitamix and Blendtec. The 1000 watt motor for the money is a good value. The programmable control panel is much more like a high-end blender. I was curious about what the rest of the world thought about these two extractor blenders, and research verified buyer reviews. Reviews for both brands were generally favorable, and mostly around the maximum 5 stars. Main complaint points about the Nutribullet were issues concerning the gasket on the blade assembly. It was difficult to clean and had a tendency to leak if not tightened down to the extreme. Main complaint points about the Ninja were it is a very loud machine. In addition, the cup and blade can twist out of the locked position and actually stop blending. Generally speaking though, the complaints were few and far apart, which aligns with my opinion that the two are among the best blenders out there. If you would like to see user reviews on these two blenders, here are the links to the Amazon review pages for NutriBulle﻿t or Ninja Bullet​. 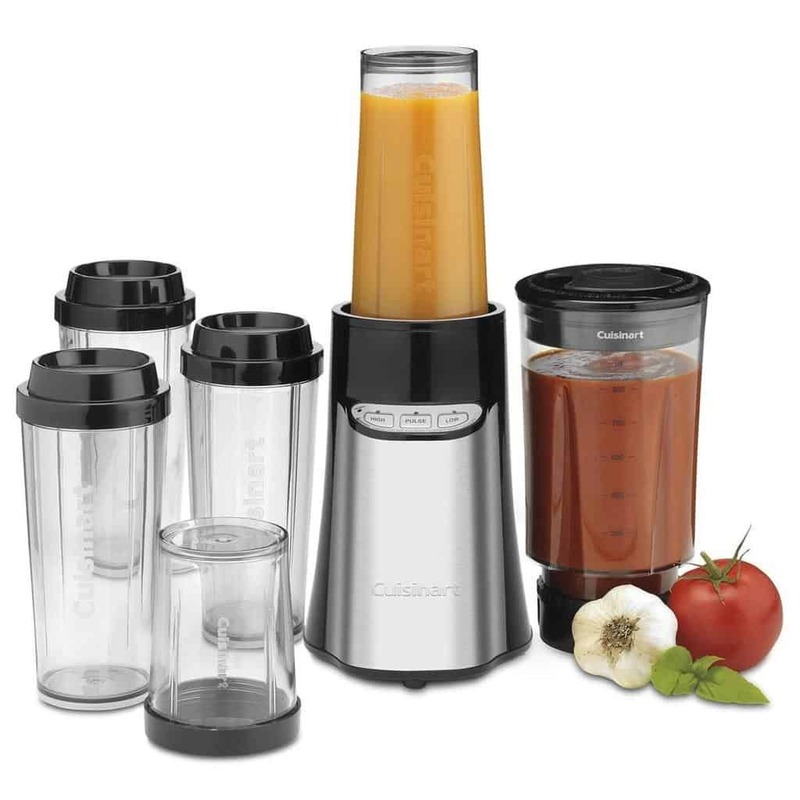 The Cuisinart CPB-300 is a personal blender with a few upscale touches. 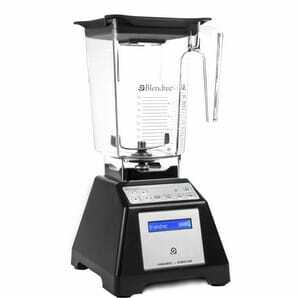 This blender falls in the low-end mostly due to a smaller motor (300 watts). It does however have a digital control pad with pulse options, standby mode, and auto stop features. Falling in the mid-range is the New Age Living BL1500. 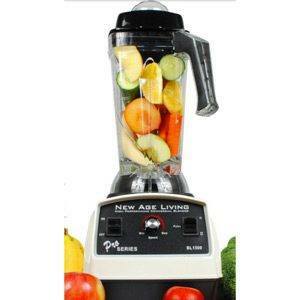 Labeled as a high performance blender, this unit has a 1500 watt motor. It has variable speeds and a pulse function. Priced roughly around the same price range as our two focus blenders, this unit also has a 5-year warranty. This blender is a good choice for those who want more power but want to stay in that mid-range price. This high-end blender has all the bells and whistles. The Blendtec Home HP3A is approaching the top of the line. It offers the power to crush even the toughest ingredients with its 1560 watt motor and the versatility of 25 programmable blend settings. It has a compact 15 inch height to guarantee a fit under most cabinets for easy storage. The Blendtec offers much more than standard blending, including juicing, ice cream and bread dough. This blender is for you if you value performance and versatility over price. The Blendtec name is well-known and this machine’s capabilities will give you the extra added value a performance conscious person is looking for. So there you have it - two mid-range extraction blenders that are considered a good value for money choice. Both offer capabilities and features that stand out from the rest, each a little unique from the other. Both are good little machines for the health conscious wanting to step it up a notch. We did like the Ninja better for its performance and extended warranty, so that's our Top Pick. The Nutribullet is a good choice for you if you are looking for an easy to use, no extra frills extraction blender for a healthier you. 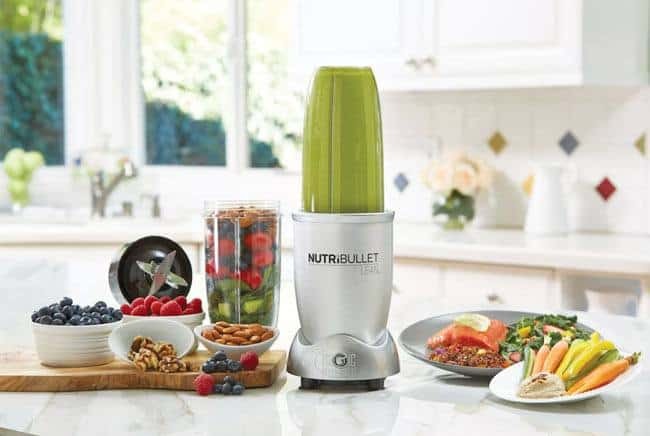 It has a good motor and strong blades, backed by the Nutribullet brand. The Nutri Ninja is a good choice for you if you are looking for a few more frills. 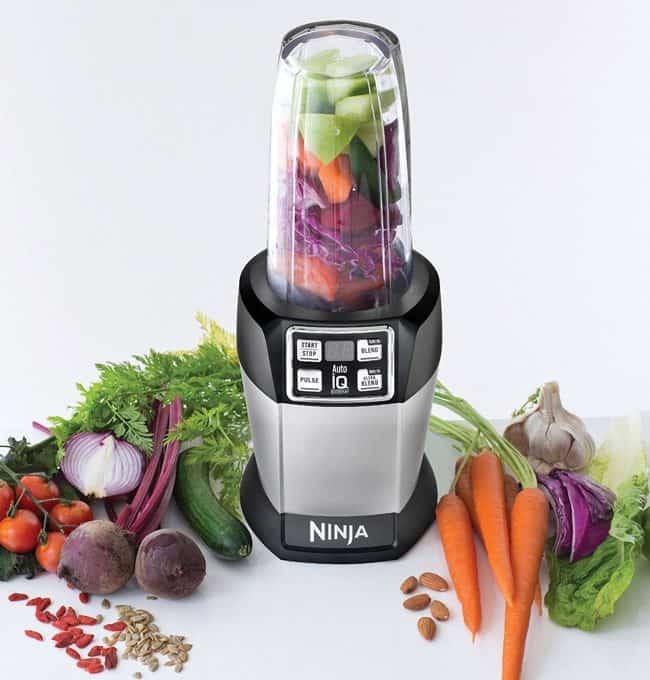 The Ninja extraction blender offers digital control panel with two speeds plus pulsing. It has a powerful motor and effective extractor blades. This unit is also backed by the Ninja brand. I would be interested to know what you think. Share your experiences with extraction blenders in the comments below. If you liked this review, or think it could help your family and friends, do share it. 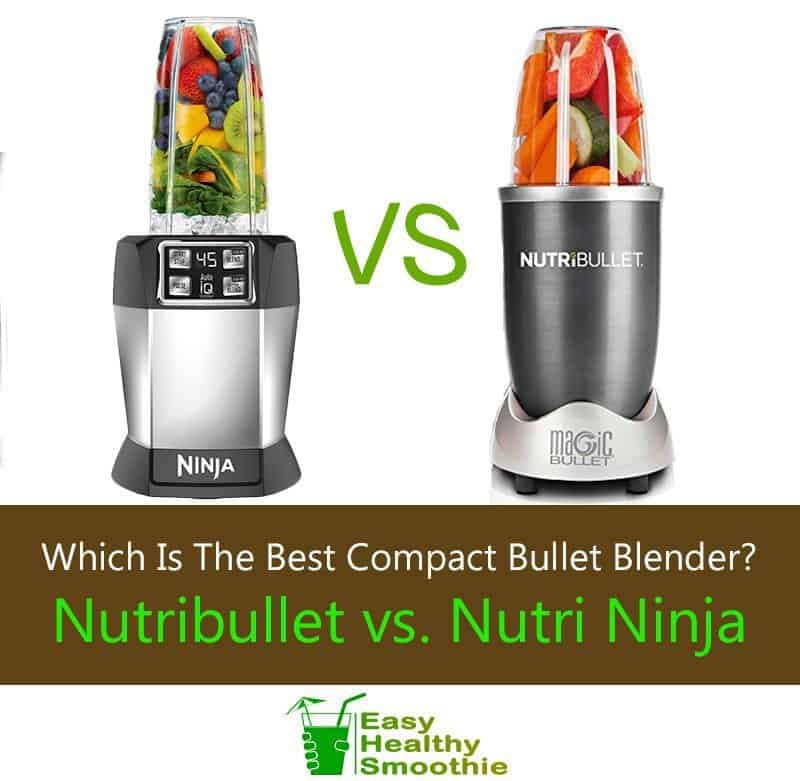 Nutribullet vs. Ninja bullet – Which is the Best Compact Bullet Blender? Real user review! Which bullet blender is right for you? 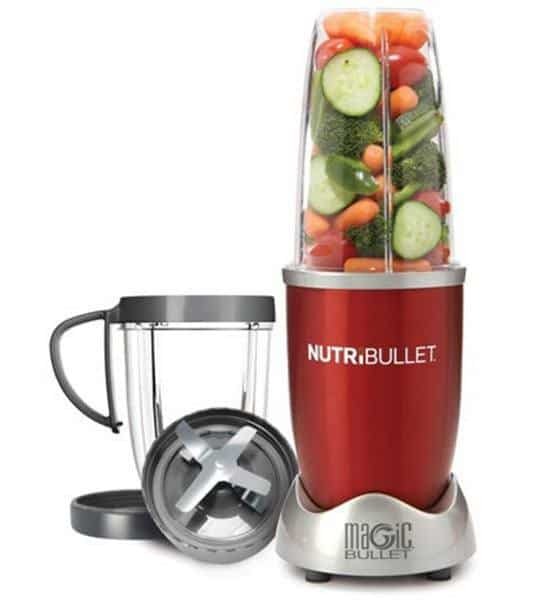 Is the Nutri bullet or Ninja good enough to turn vegetables and fruits into delicious smoothies? I bought a Nutribullet not too long ago, absolutely love it! It does what I need it to and I find it really easy to use.